This is a satisfying early English sequence two-step composed by Flo. Almond in 1913. Side by side facing LOD, Follow's left in Lead's right. Part I - Point and Walk (4 bars): Point outside foot forward along LOD (1), then point outside foot back against LOD (3), slightly bending the knees and turning head to face partner. Then walk four steps along LOD, closing feet on the fourth step (5, 6, 7, 8). Part II - Rollaway and Walk Apart (4 bars): A full two-step rollaway along LOD (1-and-2, 3-and-4), then walk two steps along LOD (5, 6) and side, close along LOD (7, 8), closing up to closed position. Part III - Two-Step and Walk Together (4 bars): A 3/4 turn of turning two-step (1-and-2, 3-and-4), ending up with Follow backing, then back the Follow two steps (5, 6), and side, close along LOD (7, 8). Part IV - Two-Step* (4 bars): Two full turns of turning two-step (1-and-2, 3-and-4, 5-and-6, 7-and-8). * For advanced dancers, the description notes that the turning in Parts III and IV can be either to the right or to the left. 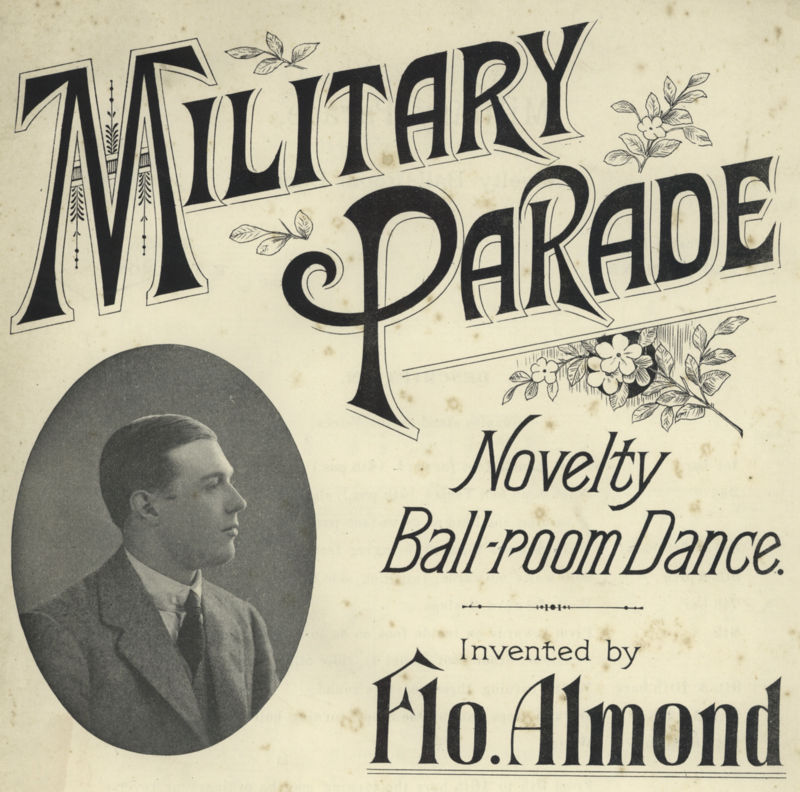 There's an eponymous tune composed specifically for the dance by R. T. Almond, but any square, early 20th century two-step will work nicely. Flo. Almond. (1913). 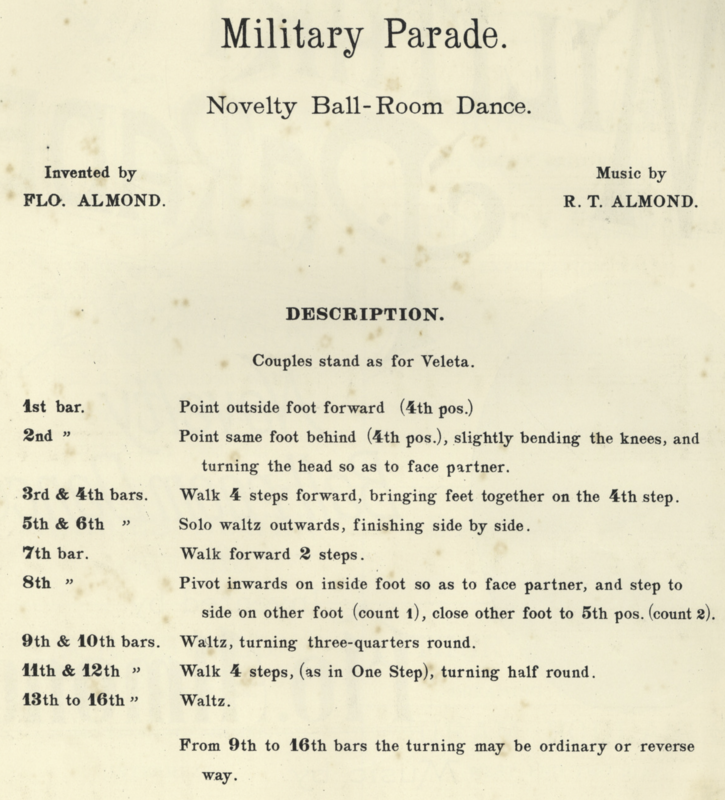 Military Parade, Novelty Ball-Room Dance. London. Thanks to Richard Powers for providing several helpful suggestions to improve this page.